The Riverfront Trail Extension Project, which will double the length of the existing trail on the Atchison Riverfront, has received final approval from the Atchison City Commission. Construction is scheduled to begin in March and be wrapped up by mid-summer, prior to the commencement of the Amelia Earhart Festival in mid-July. The $330,000 project is being funded by a $250,000 federal Recreational Trails Grant and an $80,000 contribution from the Atchison Riverfront Foundation. The Riverfront Trail Extension Project will extend the same design concept as the rest of the Atchison Riverfront to the north along River Road. The ten-foot-wide trail, which currently ends near the intersection of Atchison St. with River Road, will extend just past the City’s Raw Water Intake Facility after project completion. Julius Kaaz Construction will serve as the general contractor, beating 12 other bidders to win the contract for the project. 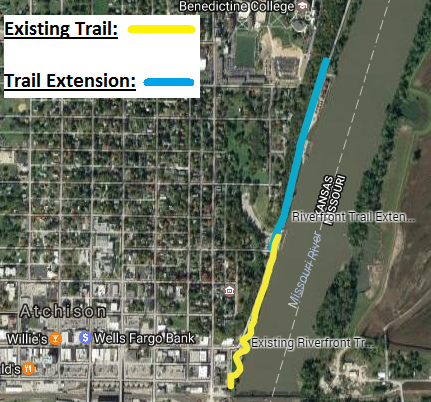 Summary: This project will construct an extension to the current trail that runs the length of the Atchison Riverfront. The extension would be a 10-ft.-wide concrete path that would double the length of the current trail from about 0.4 miles to just under 1 mile. The extension will run on the east side of River Road from the south boat ramp to just north of the City’s Raw Water Intake Pump Station. The City Commission authorized a contract with Schwab-Eaton for topographical survey services on June 5, 2017. The official project agreement with the Kansas Department of Wildlife, Parks, & Tourism was approved by the City Commission on July 17, 2017. Funding: This project is funded with a $250,000 grant through the federal Recreational Trails Program. Additionally, the project will receive approximately $80,000 in funding through the Atchison Riverfront Foundation.